Randolph Bourne was born in Bloomfield, New Jersey on 30th May 1886. Bourne was badly disfigured and a hunchback since birth. His biographer, Casey Nelson Blake, has pointed out: "A forceps delivery permanently disfigured his face; spinal tuberculosis in infancy left him a hunchbacked dwarf." Bourne had a troubled childhood and his father eventually abandoned the family after years of alcoholism and financial problems. Bourne was unable to go to university for financial reasons. As Jeff Riggenbach has pointed out: "But he was broke. He could barely afford books, and his mother needed help with her living expenses. He went to work and stayed there for six years. He knew his way around a piano, so he took jobs as a piano teacher, piano tuner, and piano player (accompanying singers in a recording studio in Carnegie Hall). He cut piano rolls. He was also highly literate, so, between musical gigs, he took in proofreading and even did secretarial work." Bourne entered Columbia University in 1909. Over the next few years he was deeply influenced by the works of Karl Marx, Henry George, Walt Whitman, Charles Beard and John Dewey. He joined the Intercollegiate Socialist Society, an organization established by Jack London and Upton Sinclair. Its stated purpose was to "throw light on the world-wide movement of industrial democracy known as socialism." Other members included Norman Thomas, Clarence Darrow, Florence Kelley, Anna Strunsky, Bertram D. Wolfe, Jay Lovestone, Rose Pastor Stokes and J.G. Phelps Stokes. Bourne's first articles were first published in the Atlantic Monthly. He also wrote for the New Republic and The Masses. This brought him into contact with other left-wing radicals such as Max Eastman, who described Bourne as: "A hunchback with twisted face and ears, a bulblike body on spindly legs, and yet hands with which he could play Brahms melodies on the piano with such delicacy as brought tears both of joy and pity to one's eyes. He had a powerful mind, philosophic erudition, a commanding prose style, and the courage of a giant." Floyd Dell later recalled: "Randolph Bourne's friends were used to his appearance, and forgot about it, thinking of his beautiful mind; but at first sight he was very startling. He had been born dreadfully misshapen, with a crooked back and a grotesque face, out of which only his eyes shone with the beauty of his soul. He forgot this outward aspect, or succeeded in pretending to himself that it did not exist; he hated to be treated as any other than a wholly robust and ordinary person, and if anyone took his arm in going across the street, the touch would be shaken off fiercely." In his literary criticism, Bourne argued for a socially responsible fiction and helped to influence the work of novelists such as Upton Sinclair, Sinclair Lewis, Floyd Dell and Theodore Dreiser. Bourne also wrote several books on education including Youth and Life (1913), The Gary Schools (1916) and Education and Living (1917). 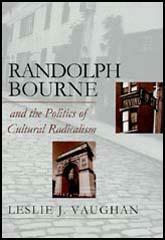 Casey Nelson Blake has argued that these books established Bourne as "an early interpreter of twentieth-century cultural radicalism". A pacifist, Bourne was one of the main figures in the movement against the involvement of the United States in the First World War in 1917. Max Eastman, the editor of The Masses, argued that "Randolph Bourne was the most stalwart of these publicists (against the First World War)". Bourne was especially upset by John Dewey decision to support the war. This resulted in a savage attack on Dewey in Seven Arts. These anti-war journals were forced to close-down as a result of the Espionage Act. Bourne wrote: "I feel very much secluded from the world, very much out of touch with my times. The magazines I write for die violent deaths, and all my thoughts are unprintable." When the Armistice came at last in November 1918, Bourne wrote his mother, hoping that "now that the war is over, people can speak freely and we can dare to think. It's like coming out of a nightmare." This was not to be as Randolph Bourne died of influenza on 22nd December, 1918. 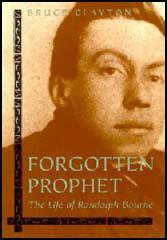 One of my most-loved war-time friends was Randolph Bourne. He had, as I think, the best intellect of any of the younger group in America; a mind always clear, poised and just upon the issues about which the rest of us wavered or went to emotional extremes. He had written a book on the newer education; and now he was one of the very tiny anti-war group, at a time when even Professor Dewey had fallen headlong into militant patriotism and was "doing his bit" by attacking the meagre handful of brave conscientious objectors in the pages of the New Republic week after week in the name of Pragmatism. I remember that, because it was my indignation against Professor Dewey and my description of Pragmatism as "convenient surrender of principles to force majeure", at some Village party, which made Randolph Bourne my friend. He had been associated with Van Wyck Brooks, Waldo Frank, Louis Untermeyer, James Oppenheim and Paul Rosenfeld in the editorship of the Seven Arts, until its subsidy was withdrawn because of its anti-war attitude. Then he found it almost impossible to get any of his writing published in any of the supposedly liberal weeklies. It was in the latter part of 1917 and through 1918 that I knew him. He seemed to like, and even to envy, the intemperate and blasting way in which I expressed my opinions in private conversation, just as I envied the temperateness and justice of his writing. In talk, each of us had a good deal of sardonic wit, which we heartily enjoyed in each other. Upon one occasion Randolph took me around to call upon Waldo Frank, who was working on a novel, and teased him to read aloud a page or two, hoping to engage Waldo Frank and me in a literary argument. The novel was modernist in style, and I asked him why he did this and that, because I didn't know, but our discussion was amiable enough. Waldo gently said to me: "I should think you would want to write in the experimental modern way, and not in the old, formal Victorian way," or something to that effect; and I, thinking of my unfinished novel, said: "By the time you have triumphantly demonstrated the virtues of the new way of writing novels, I hope to have learned the old-fashioned way of writing them." But upon other occasions, with a better opportunity, Randolph succeeded in, evoking the argumentative fireworks he had been hoping for, which he relished with a huge, diabolical grin. Randolph Bourne died in December, 1918, of pneumonia, leaving only a fragment of his book on The State; and America lost one of its most greatly gifted minds, imprisoned in that frail and pitiful body. Randolph Bourne was the most stalwart of these publicists (against the First World War), a hunchback with twisted face and ears, a bulblike body on spindly legs, and yet hands with which he could play Brahms melodies on the piano with such delicacy as brought tears both of joy and pity to one's eyes. He had a powerful mind, philosophic erudition, a commanding prose style, and the courage of a giant.